Weekends are very busy for the both of us…It is one of those days when we make back and forth calls to India, skype chat with 2 sets of parents and before we realise, more than half the day is gone and not to mention way too late to cook lunch… This Sunday was no different.. After a rather lazy morning and 2 very long skype calls back home, I had no energy to cook lunch… But we were terribly hungry and more important, my husband had just discovered this murder mystery movie online and we just had to watch it… Plus my folks had just seen the movie so the feedback was available.. So I needed something quick easy and tasty… That is when I remembered how about Chirer Polao, or a sort of a stir fry flat rice or Poha.. That use to be my favourite winter breakfast with lots of fresh vegetables and the flavour of the spices, most important that light yellow colour of the poha, gorgeous, yummy and needless to say mum’s was the best…. 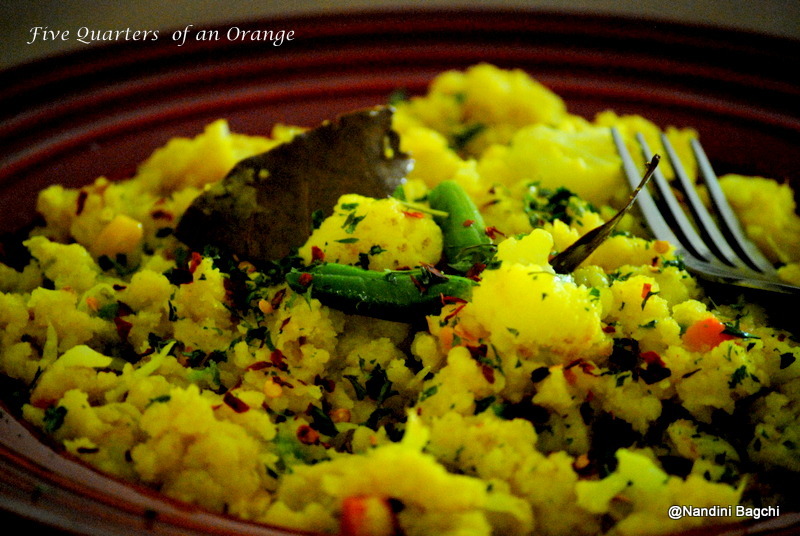 So I had to dig into my memory and well this is what I came up with..
First of all, soak the poha for about 10 mins and drain them, do not over soak them as they tend to break up… Now take the potato pieces and gently fry them, do the same for the cauliflower florets.. Gentle fry do not over cook.. Keep them aside. If you are using peanuts, fry them at low to medium heat, make sure you do not burn them.Take a heavy bottom pan. Heat 3 table spoon of oil.. 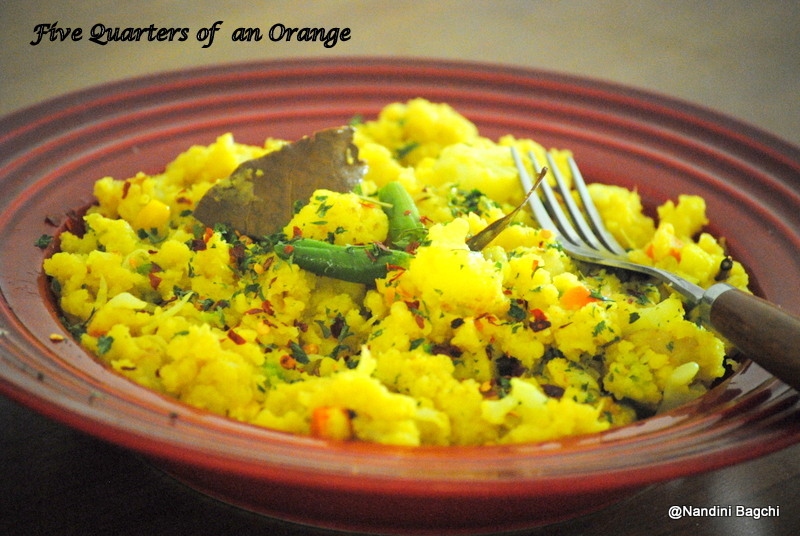 When it is ready, temper the the spices the whole garam masala, when they start emitting the flavour, add the onions, saute them .. Then add the already fried potatoes and cauliflower florets and the diced carrots… Saute them well and then add the turmeric and red-chilly powder. 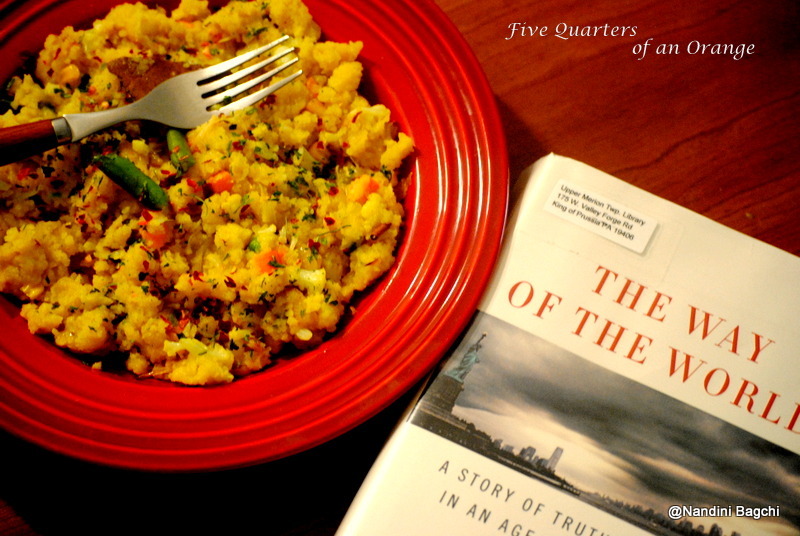 Add the flatten-rice and mix it well, if it dries drizzle with olive oil and if you are using peanuts add them now.. drizzle with lime juice and garish with coriander leaves..
As for the movie the print turned out to be sad and after a while I escaped to my books…..